With the onset of eCommerce Website, the public is availed with an opportunity in accessing the products and services 24 x 7. One can easily access to the Ecommerce website services depending on their convenient timing and other comforts. Unlike the conventional storefronts, one need not plan in advance to shop their articles. This is one of the attractive feature, that today eCommerce has grown into an undeniable choice among the shopper community. At the very same time, an eCommerce Website acts as the online facet for a business company to showcase themselves before millions of potential mass. With the advent of eCommerce sites, today a large degree of population has desired to go after the online portal rather than going to traditional stores. What makes an eCommerce website prominent among customers? > As said above, convenience and easiness to shop a product/service from their home at any time day/night is the major attraction element behind. eCommerce enables with quick, convenient and user-friendly buying options saving consumers time and money. > Decision making is made easier with E- commerce via giving consumers the description and details from online product catalog. > Be it any occasion like birthday, marriage or other special days, E-commerce acts as a convenient choice. Right from choosing among the product components, their easy payment gateways to their timely door delivery is assured in eCommerce. > The selected service/product will be delivered to the specified address on time, providing ultimate shopping experience to the customers. > One of the ever sought and favorite feature of eCommerce website is their “wish list” feature enabling the end user to add their favorite products in cart and save them for later buy. > Timely feedback of eCommerce. In case, if your product request gets delayed or doesn’t reach you, a good eCommerce Website enables you with the provision of registering a complaint. The required measures will be taken then for ensuring the safe delivery of goods without much further delay. > An e-commerce website also allows customers to post their comments regarding products and services. Thus, the owner of the website gets a feedback which can be later used or implied for further improving the services making them more responsive and robust. > An easy and multiple payment options within an eCommerce assures eCommerce portal users no hindrance in their shopping. How do eCommerce website turn beneficial to Retailers/ Business Organization? > An E-commerce platform, makes easy for businesses to launch channel specific or multi branded eCommerce website. This feature enables to focus on specific customers as well as general spectators. > With effective eCommerce solution, an organization can scale easily to meet market demand by introducing different sales channels and reaching market segments. > With an e-commerce business, the suppliers can decrease the maintenance cost of inventory goods. Also they can automate the inventory management using web-based management system saving operational costs. > E-commerce retailers can easily keep constant eye on consumers’ buying habits to tailor accordingly. > E-Commerce comes with low setting-up cost. Requires few licenses and permits and also less employees to perform operations like billing customers, managing inventory and more. > Running a physical store is permitted within a geographical area, but an E-Commerce website, can sell products and services across the world without any geographical constrain. > As E-commerce runs 24 x 7 on all 365 days, merchants can easily increase their sales by boosting their number of orders. How to build an efficient eCommerce Website? How Odoo eCommerce caters to the diversified needs of the customers? Odoo eCommerce is an open source ERP application that helps the end user to manage their e-commerce operation. One can seamlessly integrate their warehouse, shipping, product promotions, and payment gateway services in Odoo. Also Odoo eCommerce, efficiently manages the necessary network and distributors, thereby allotting the real time access to the resellers. Also the embedded geo-localization feature in Odoo helps in forwarding the leads to resellers maintaining the equilibrium. Odoo eCommerce facilitates with creating awesome product catalog along with product description for better understanding and clarity of users. Also the Odoo eCommerce features are highly scalable for any system integrations and also making it easily customizable. One can easily design and create stunning product pages via simple drag and drop of designed interfaces. The numerous building blocks/ template variants within Odoo Website builder, helps in setting the desired elements into place thereby enhancing the visual appearance of your Odoo eCommerce Website. One can drag and drop images, banners, slides, call to actions, text blocks and even more. Odoo Website builder can create and edit your products and since everything is synced and integrated, the information from your inventories will also be updated. You can use clean building blocks to edit and improve your shop according to yours and customer’s needs. All the changes you make to your website are instantly viewed in mobile preview option. This helps you to adapt the eCommerce portal for mobile as well and made accessible 24x7 on any kind of device. In short, get a responsive and exquisite E-commerce experience. Odoo eCommerce comes with high degree of customization. It has an extensive option for editing the text inline straight on the web page for fine tuning the product description, characteristics and images. In short it helps in emphasizing the products in their best way. With the full featured CMS, one can easily create and update though the text content through an editor designed to replicate the word processor experience. 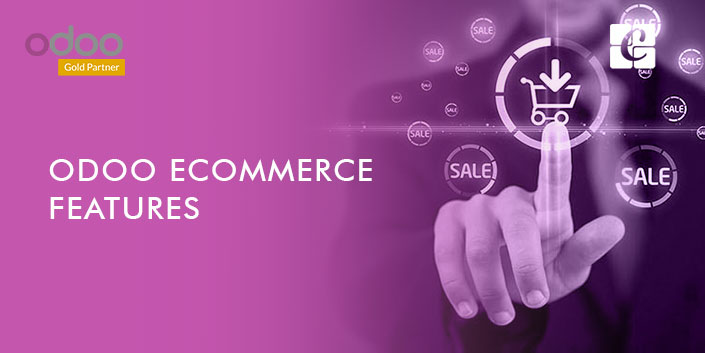 Odoo eCommerce website also helps you in easy managing the products like whether you want to replace the product or change their price, highlight any product descriptions or create discount offers. In Odoo, with a single click you can enable all these options. You can change your Odoo e-commerce online stores to any layout or any color which you want. You can easily customize your store with Drag and Drop interface and pick up any color which you want to paint on your online store. Easy to fine-tune your Catalog and highlight the best product along with discounts, special offers. You can set grid and list view as per your need. 2. Each order can increase your Revenue. Sell more with up selling, cross selling and product variants with multiple attributes in Odoo eCommerce. With Odoo eCommerce one can display the website visitors, more over similar but more expensive products as alternatives from your catalog. Offer them extra products related to what the shopper puts in his cart. Allow your shoppers to select their product with different color, weight, size and more! The cross-selling feature of Odoo e-commerce helps you to offer other products similar to what customer has put in his cart. The cross-selling algorithm of Odoo allows you to display the related products while purchasing which can lead to up selling income. 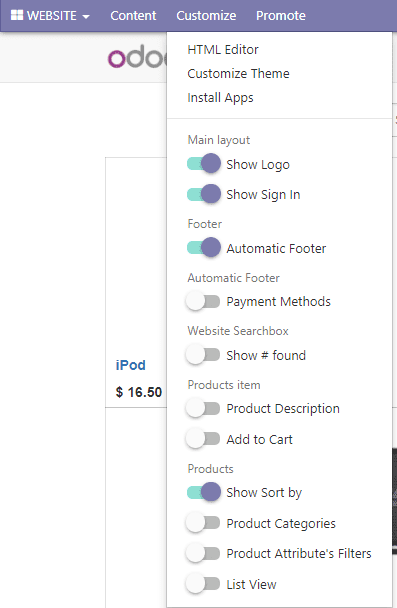 One can also add suggested products and product attributes like color or size. Customize the color, layout and font of your theme. Odoo eCommerce website enables you to sell your products online in a beautiful storefront designed with mobile in your mind. Odoo eCommerce Website not only manages the front end but also efficiently manages the back end performances like that of effectively tracking the business performance with Google Analytics integration. 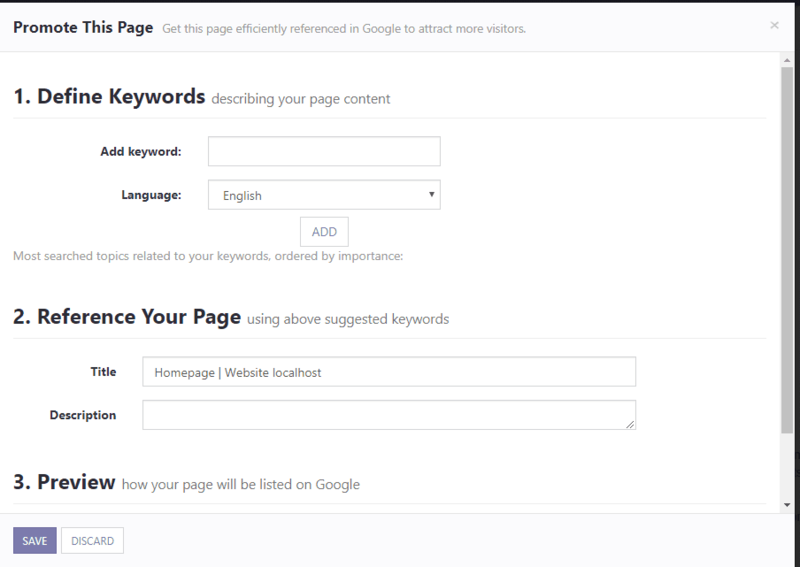 This feature helps in easily counting the website impressions, call to actions and clicks. The Odoo Website SEO suite is robust and always stay abreast in checking the content relevancy in real time. It formulates for more number of website visitors with better-targeted contents of products and services. Odoo helps you to go international. The Odoo eCommerce comes with language translation feature allowing to translate languages automatically with a click. One can easily edit the master page and Odoo’s on demand professional translation service, change the necessary part of the website for any language. This action gets automatically updated within 32 hours. Search, find out and identify new customers with the help of dedicated keywords which are mostly used on Google search using keyword research tool in Odoo e-commerce. It helps you to add products and in parallel manage the inventory for your eCommerce store. 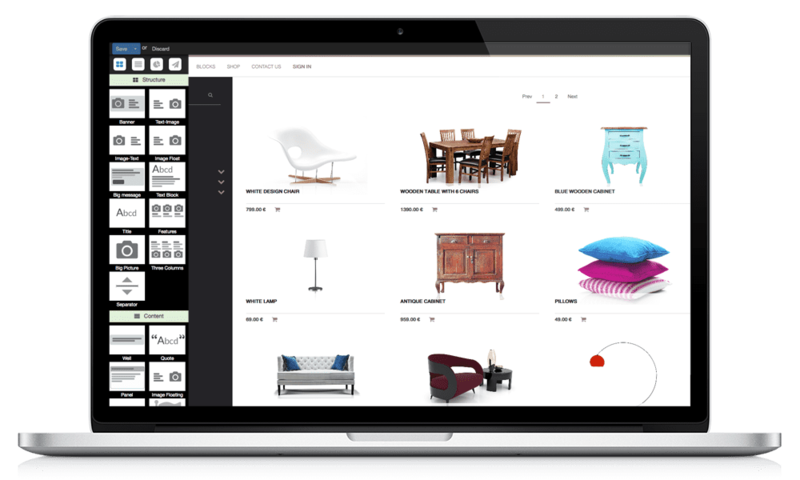 One can seamlessly add products, upload their photos, set stock levels and more to build and manage eCommerce website's inventory. 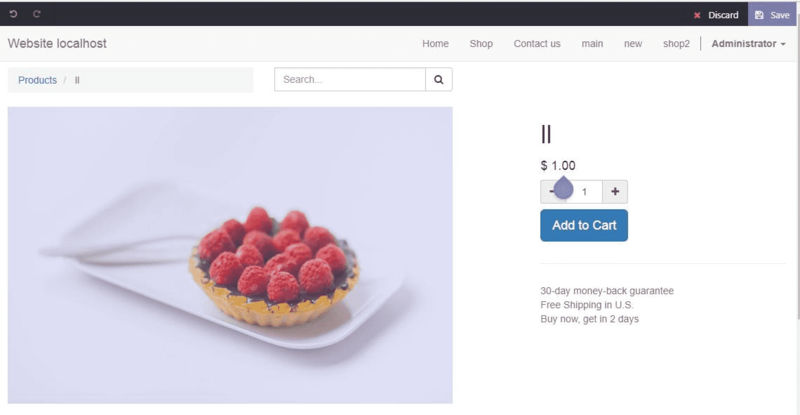 Optimization/Resizing of product image is automatically done by Odoo. One can either add products by one at a time or bulk-import all products from an Excel CSV file, eBay or Magento or Amazon. One can also speed up the shipment process and track packages from Odoo via integrating some of the famous shipping providers like UPS, DHL, USPS and FedEx Odoo keeps track of the status on all shop orders, analyze the order history with Odoo's amazing sales analysis BI tools to build better customer relations and target your marketing campaign. When it comes to payment options, every online business has different options to display. With so many variables to consider like the kind of product or the frequency of sales come different requirements for the offer of payment types. But no matter what you are selling you want to give your customers the freedom to pay by any type of payment they like. In Odoo you can find apps for any payment provider. You can pay for the items in your shopping cart using payment methods like Wire Transfer or directly from the famous payment gateways like PayPal, Ayden, Buckaroo, Ogone or Authorised.net. If you want to get your online store setup in minutes, use PayPal to accept credit card payments. When you hit a high payment volume, you can easily upgrade to another payment gateway like Authorize.net or Ogone. Also based on your location, Odoo will automatically handle major country and state tax rates with fiscal positions configured at backend. 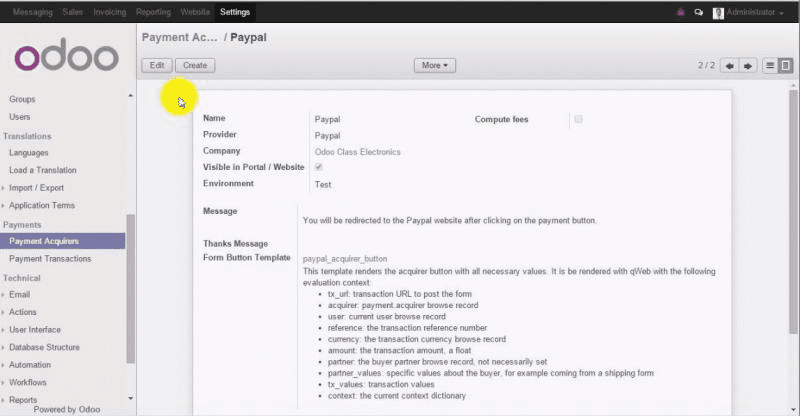 In Odoo you can get your preferred payment modules integrated and customized. You can install your payment type with one click. The One-step Checkout in Odoo is improved to bring the customer all the way converting their customer’s interests into real orders. It is clean, user-friendly and responsive. 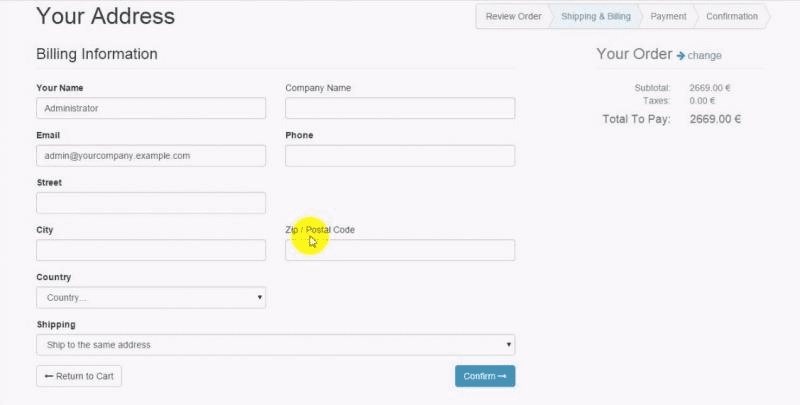 You can customize the checkout however you need it to fit your business. There is also easy integration to different payment systems, delivery methods, cross-selling, sales, etc. Provide your visitors with information in real time directly on your website, and secure your sales. 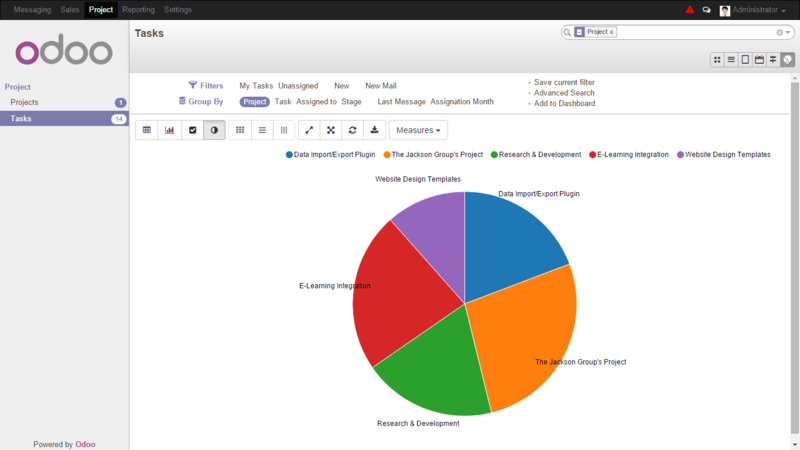 Odoo also includes built-in blogging app. A blog can act powerful tool for shedding great sales and marketing tactic. With regular blogging in your eCommerce store, can draw the shoppers closer to the company. Every information pertaining to latest offers, products & news can be provided through blogs from organization side. Odoo highlights the best product in terms of quantity sold and it also helps in finding the best customers in terms of revenue. Display a graph with your monthly sales per product and add it to your Dashboard. Group your Sales by Partner and display the products in the column header. With Odoo's amazing and advanced data visualization & discovery reports for your online Sales, you can wow your executive team with visual representations of your Online Sales results. With Odoo's intuitive customer portal feature, your shoppers can track of which orders have been paid for, shipped or delivered. Provide your shoppers with a complete 24/7 access to up-to-date information through a dedicated customer portal where they can track their orders, download their invoice or delivery order and manage their return and claims. No need to navigate across multiple documents - everything is centralized in one place. Are you interested to building an E- portal for your business, if yes kindly drop your request to info@cybrosys.com. Cybrosys Technologies is an exponent of Odoo ERP and its allied services. We have more than 10 years of experience in Odoo Implementation and Customization services.